Book sent by publisher for review. Remy took a deep breath as she stood on the edge of the narrow plunge board. Above her, the old material of the big top's roof was close enough to touch. Below her was nothing at all but air dirtied by dust and tobacco smoke, and then, sixty feet below, arranged around the sawdust of the circus ring, there was the crowd. 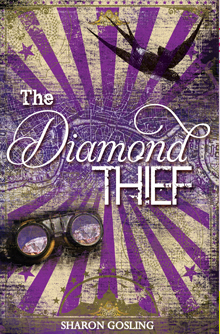 I was lucky enough to get my hands a copy of The Diamond Thief, which is the first publication from Curious Fox. I remember the story originally coming out in an online chapter format through Fiction Express and I missed the opportunity to read it then. I‘m so glad I waited for the final publication through Curious Fox who eagerly picked it up. From the first few paragraphs you are instantly transported to the circus, set in a dirty Victorian London. Remy literally flies into the scene, stealing the hearts of the audience and instantly grabbing the reader’s attention. One member of the audience is quite entranced by her, however it does appear that Remy isn’t what she seems. As the book progresses you see her regularly coming up against Thaddeus Rec, the complete opposite of Remy. By night she is a jewel thief, while he pounds the streets as a very honest policeman. He is determined to capture her for a crime, not once ever thinking that she would capture a part of him. The characters are enigmatic and some are slightly bigger than life. The Professor has glimpses of Doc from the Back To the Future films. Desai reminded me of The Indian In The Cupboard. Remy, is a gutsy girl who thinks nothing of risking her life to get what she wants. Only Thaddeus is going out of his way to stop her putting herself at risk. The book quickly embarks on an Indiana Jones style adventure as the thrown together group rush to find the diamond and stop the evil, loathsome Lord Abernathy, a master of disguise. I loved the version of Victorian London created by the author. The thrill of running with the characters in the tunnels underground and discovering the inventions lurking to be discovered put me in the mind of Jules Verne. It had a steam punk feel to it, but I wouldn’t say it necessarily fitted into that category. This is a very promising start for Sharon Gosling, a book filled with wonder and adventure, thrilling and exciting, with a delicate love story blossoming at the heart of the story. I really enjoyed it and read it in two sittings. Well done Curious Fox and Sharon Gosling for bursting onto the publishing scene with such a magnificent debut! Hiya I love this book and this is a great review but I wished the book would carry on because it's a really exciting adventure!